Pregnant? Need help? Don’t know what to do? An unplanned pregnancy can be a stressful and confusing time. We understand the difficulties and are here to listen and help. 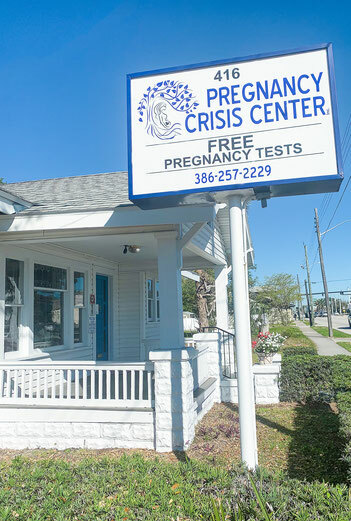 The staff and volunteers of Pregnancy Crisis Center care about you. This is a place where you can feel safe, talk to someone in confidence. Learn more about your pregnancy and take a free pregnancy test. You may feel overwhelmed. Others may be telling you what to do. Our hope is that we can provide the information you need to make your decision based upon you and your future, and not what others expect of you or think you should do. You owe it to yourself to get all the facts about your pregnancy. We can help you find the resources you need now and also give a helping hand with referrals for social services and medical care. Send us an email or call us at 386-257-2229 to set up an appointment. Free pregnancy test with immediate results. Help resolve fears and problems of unplanned pregnancies. Referrals for medical care, social services and housing. Referrals for adoption, financial needs and continuing education. Free counseling for the mother and father. Help for women who have had an abortion. Referrals for food and support groups. Clothing and supplies for mother and baby. On going support and friendship.